Beautifully engraved RARE Specimen Certificate from the Boston Elevated Railway Company printed in 1920. 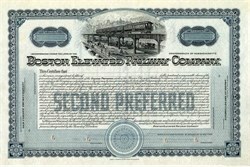 This historic document was printed by the John A. Lowell Banknote Company and has an ornate border around it with a vignette of the elevated railroad in Boston with horse drawn carriages below. This item and is over 90 years old. This is the first time we have seen a specimen certificate from this company. 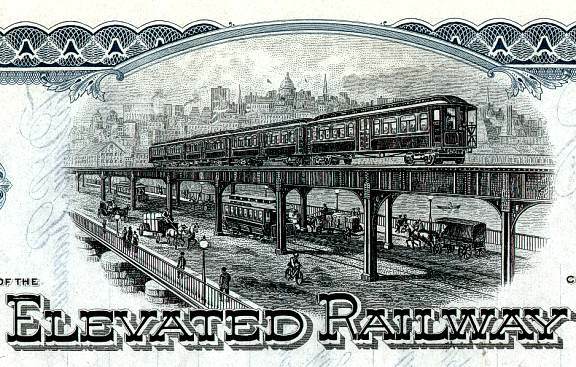 The Boston Elevated Railway (BERy) was a precursor first to the Metropolitan Transit Authority in Massachusetts, now the Massachusetts Bay Transportation Authority, operating rapid transit, streetcars and buses in the Boston, Massachusetts area. It was formerly known as the West End Street Railway. The rapid transit lines have evolved into the Red, Blue and Orange Lines. The only streetcars that remain are the various branches of the Green Line and the Ashmont-Mattapan High Speed Line; the rest have been converted to buses. Arlington Belmont Boston and the municipalities that have been merged into it Brookline Cambridge Chelsea Everett Malden Medford Newton (only to get between Boston and Watertown) Somerville Stoneham (only the southern bit, in the Middlesex Fells) Watertown Additionally, streetcars from adjoining towns, run by other companies, operated over Boston Elevated Railway trackage. Originally intended to build a short electric trolley line to Brookline, the West End Street Railway was organized in 1887. By the next year it had consolidated ownership of a number of horse-drawn streetcar lines, composing a fleet of 7816 horses and 1480 rail vehicles. As the system grew, a switch to underground pulled-cable propulsion (modeled after the San Francisco cable cars) was contemplated. After visiting Frank Sprague and witnessing the Richmond, Virginia system in action, WESR President Henry Whitney chose to deploy electric propulsion systems. A section of track tested the Bentley-Knight underground power line, but this was abandoned because of failures and safety concerns (especially after the electrocution of a team of horses in 1889). After competing in operational tests with the Sprague streetcar system, the Thomson-Houston company was chosen for system-wide deployment of overhead wires. The first electric trolley line built by the West End Street Railway was between Union Square, Allston and Park Square, downtown, via Harvard Street, Beacon Street, Massachusetts Avenue and Boylston Street. Trolleys first ran in 1889. The Green Line "A" Branch later served roughly the same purpose. The last horse car line was along Marlborough Street in the Back Bay, and was never electrified. It was closed around 1900. In the late 1800s, the electric power industry was in its infancy; the power grid as we know it today simply did not exist. The railway company constructed its own power stations; by 1897, these included distributed generation stations in downtown Boston, Allston, Cambridge (near Harvard), Dorchester, Charlestown, East Cambridge, and East Boston. By 1904, the system had 36 megawatts of generating capacity, 421 miles (678 km) of track for over 1550 street cars (mostly closed but some open), and 16 miles (26 km) of elevated track for 174 elevated cars. The first bus route was in 1922, between Union Square, Allston and Faneuil Street. In 1933 this was merged with the Union Square - Central bus and later became the 64 bus. The difficulty of transporting coal over land from the Port of Boston and the short range of the direct current system prevented significant expansion inland. In 1911, a large generating station was built in South Boston which produced 25 Hertz alternating current, which could be transmitted long distances at high voltage, to substations which would drop the voltage for use by trains. The system was gradually converted until completion in 1931, when 14 substations were in place. This station would operate until 1981, when the MBTA decided to purchase energy from local utility companies instead of running its own generators. The first trackless trolley route was the 77 (later 69) Harvard - Lechmere via Cambridge Street on April 11, 1936; trackless trolleys still run from Harvard station (on Routes 71, 72, 73, and 77A). Operations of the company were taken over by the Metropolitan Transit Authority in 1947.